For most of us, adequate, peaceful, restful, sound sleep is all but a dream. Everyone wants more restful, more rejuvenating, more comfortable sleep, and not to mention more of it. But how do you do it? You might say “I’m too busy for sleep” or “I lay in bed wide awake… so why bother?” Sleep is the first thing we give up when we are time poor. We stay up that hour later to watch our favourite TV show, that chore we neglected all day. We get up that hour earlier so we can prepare that lunch we forgot to make last night, or because we must send those important e-mails out before the start of the workday. Humans are the only mammals to delay sleep on purpose, and we suffer because of it. This post will get you more in touch with your bodies sleep patterns, tell you why you should be making sleep a bigger priority, give you plenty of tips on how to achieve longer more restful sleep, and how seeing your chiropractor could be the answer you’re looking for. Everyone should be getting 7-9 hours of sleep every night! Sleep is our bodies’ one chance to slow down, rejuvenate those body systems, restore and heal itself. Those of us who are getting less than 7 hours of sleep are considered sleep deprived – that’s right, DEPRIVED. Sleep deprivation can lead to a variety of health problems over the long term, but can also have short term negative effects as well. How many of you have forgot someone’s name and blamed it on being tired or sleepy? Well you’re right to do so, sleep deprivation can impact your memory in a negative way. How about catching that newest cold? Sleep deprivation can lower the efficiency of your immune system. Serious health problems can also be attributed to sleep deprivation. For example, Obesity, how many of you have ever blamed your waistline on inadequate sleep? Well believe it or not poor sleep habits can lead to overeating and obesity. By not getting enough restful sleep the body hasn’t had enough time to recuperate and restore its proper energy storages, from this your body starts to crave energy! How do we get this energy? From food of course, we start overeating. This can continue down the line and cause severe health problems such as diabetes. Another serious health conditions caused by sleep deprivation is heart disease. Studies have shown that people who get inadequate sleep have higher amounts of C-reactive protein in their blood streams, this is an inflammatory protein that is indicative of many diseases such as arthritis, heart disease and even strokes. By getting 8 hours of sleep per night these serious health risks can be reduced; But we all know it’s not as simple as getting into bed and staying there for 8 hours. As a chiropractor, I see clients who struggle with sleep. Some struggle because of headaches or body pain, some struggle because of stress, some because they are just too busy. TOO BUSY? This comes down to making sleep a priority, we need to create a sleep routine for our bodies. This allows the body to get into a proper sleep cycle which includes 8 hours of sleep per night. Try setting a “bedtime” that will give you 8 hours of sleep, set a phone reminder. Don’t sacrifice adequate sleep for other non-essentials like TV shows, or those chores you procrastinated doing. Studies have shown that even minor things like avoiding a large meal before bed, and going to the gym to burn excess energy will improve your sleep pattern, and help get you to sleep sooner and for longer. It should take you 15-20 minutes to fall asleep. 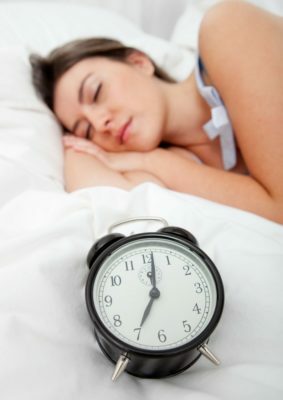 Anything less than 5 minutes to fall asleep indicates that you are in fact sleep deprived. Your sleep environment is important! You should have a cool, dark, and quiet space to sleep in. Studies have proven that even the light of a digital clock and mild noise like a fan or music can disturb your sleep, even if it isn’t enough to wake you. As a chiropractor, I recommend sleeping on your back or your side. Back sleepers can maintain optimal spinal alignment by laying on their back with one thin or regular pillow under their head and neck, and one pillow under the knees. This helps the neck region be more in line with the shoulders and reduces low back stress with the pillow under their knees. Side sleepers can achieve good spinal alignment by having a thicker/firmer pillow under their neck do keep the neck straight without dipping downward or pushing upward, and place a pillow between the knees to reduce hip strain and any rotation of the pelvis either forward or backward. Our busy lifestyles are manufacturers of stress. Medically, our bodies thrive under stress. Stress stimulates our sympathetic nervous system, which initiates that “fight or flight” response. It gives us focus and the motivation to tackle these “threatening” issues. Long ago these threats used to be things like getting eaten by a predator, or chasing down that delicious meal, but today the threats are getting the final notice on your rent payment, or chasing down that cab so you won’t be late to a meeting. This constant stress environment that we live in today has made our bodies overstressed and in a constant state of “fight or flight”. What this does is creates a nervous system that is dominated by your sympathetic nervous system, and pushes the parasympathetic nervous system aside. The parasympathetic nervous system initiates the “rest and digest” state of our bodies, which as you may have guessed, is important for our sleep patterns. Routine visits to your chiropractor for spinal realignment can help your body regulate the nervous system and help improve the balance between the sympathetic and parasympathetic nervous systems. Less stress hormones, less stress responses… less sleep deprivation caused by stress. In the end, you know your body best, and you should tailor your sleep to your own preferences. •	Assess your sleep patterns, identify where you struggle regarding your sleep, and use the tools at hand to get more peaceful, restful, sound, and rejuvenating sleep. •	Make a sleep diary if you can’t find any patterns right away. •	Get some chiropractic care and talk to you chiropractor about your sleeping. Make sleep a priority and get your full 8 hours nightly. Take back your health, and start by letting your body do the healing with longer, more efficient sleep!